Gumbo II (Pretty Ugly) marks a new state of the art for sample-based productions. Taking his trademark formula to perfection, Brenk brings together 70’s soul with twisted electronica, analogue korg lines, Lil John ad-libs and police sirens, all backed by the most relentless grooves and drum-loops. 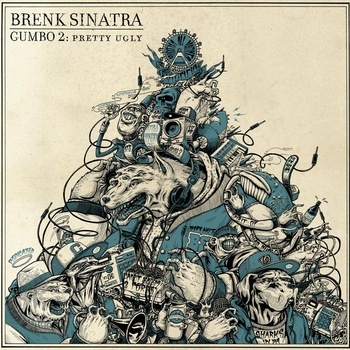 While every track works for itself, „Gumbo II (Pretty Ugly)“ takes you on a heavy ride through music history: From the embracing brazilian sounds of „Perdido“ to the grimey talkbox craze of „Wolves 2 (Still Hungy)“ or the prog-rock stompin‘ „Hit U“. uah. Der Beat ist so geil (Wolves2), aber dieses BandCamp-Gedöns raubt mir den letzten Bock… sorry. Allein Brenk Sinatra – DOPE!! @electrolotion: bandcamp ist doch der knaller! noch nie war das vorstellen von musik einfacher wie mit bandcamp…. luv dat shiiiit! @Markus: Kennst Du den, Diggie?! Unbedingt checken, wie alles von MPM supergeil!